Want to know how to make a fluffy white paleo bread? Then you are in the right place. It’s fast and easy, and it only needs five ingredients. This is a paleo keto bread that tastes good. It’s so good you can use it for sandwiches. 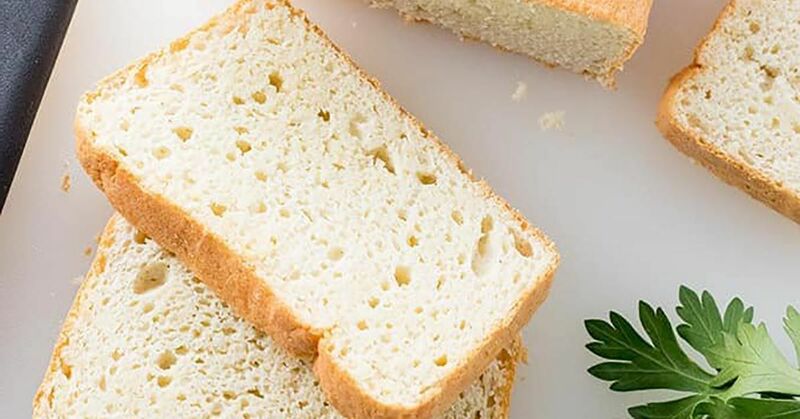 If you are looking for a recipe of a bread which does not use flour, you may like the airy and light recipe for keto cloud bread. The best thing is that it’s an easy paleo bread which you can make with some basic ingredients you can easily find in any grocery store. This is as close as possible to the traditional white bread. You should know that this recipe makes the bread sturdy. However, it still comes with air pockets and delicate crumb. It comes with little chewiness same as real bread. It toasts well, which is good to know. This recipe is the adequate replacement for the white bread. Moreover, the bread is not too heavy; it has 1g of net carbs per slice and around 82 calories. Because there are no yolks in the recipe, the bread doesn’t have that eggy taste. You should know that this recipe comes with 5 basic ingredients. Also, it contains some optional ones which are recommended for a better outcome. You should combine all the dry ingredients in a food processor. After you do that you should add the melted butter. In order to get a bread that is fluffy with air pockets, you need to beat the whites a certain way. You need to beat the egg whites to stiff peaks then pulse in half and fold what is left. Put in a baking pan and simply bake. The optional ingredients of the keto bread are cream of tartar, erythritol and xanthan gum. To get the best keto bread possible, it’s recommended that you use them all. If you prefer not to, then it’s okay. You should know that the erythritol adds a hint of sweetness, usually found in white bread. Also, people include this ingredient in a paleo diet since it is natural. However, if you do not want to add it for some reason, it’s fine. You can use some granulated sweetener or coconut sugar. In case you cannot find this ingredient, you can use any sugar-free sweetener. Then, it comes the xanthan gum. Some people avoid it. But if you decide to use it, you should only use a tiny amount which would make the keto bread so much better. The purpose of this ingredient is to make the bread more sturdy and chewy. If you decide not to include it, you should know that it stills tastes good without it. The last ingredient which is also optional like the two above is cream of tartar. The cream of tartar makes it easier to beat whites to stiff peaks. It is crucial to get the whites to stiff peaks before mixing them with the remaining ingredients. It might be challenging for them to mix, therefore having the white start out super fluffy and stiff is the way you will have a chance at not having them fall once you fold them with the remaining of the batter. 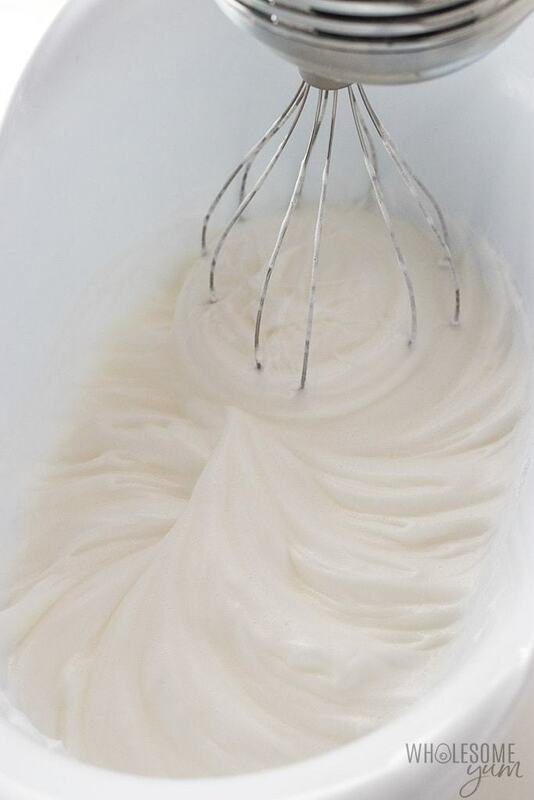 Here’s what the egg whites should look like – take a close look at the trail left from the whisk. After you finish mixing the first half of the whites into the batter in the food processor, you will have to fold that mixture. It’s crucial not to break them down completely. Because that will make the bread flat and dense. Fold it gently until you get streaks and chunks. Pulse in a little more whites in the food processor to make the main batter thinner and then fold that into the whites. Do not use a non-stick pan, because it’s most likely that the bread will stick. Make sure to use parchment paper and that it covers not only the bottom but all sides. You can also grease the parchment paper if you want to. Here’s what it should look like right before baking. You should bear in mind that the keto bread does not rise much. Most of the volume comes from whites; therefore its hight will be similar before and after you bake it. In order to lower the chance of sinking and for a more similar bread shape you should round the top before placing it in the oven. You should bake it in 325 degrees. Bear in mind that a lower temperature means that you will need to bake it for longer and that will prevent from ending up with a wet center and dreaded mushy once the top is browned. It might take longer, but it will definitely be worth the wait. Do not remove the bread from the oven too soon. This is a common mistake most people make while baking keto bread. If you do this, the outcome will be a fallen middle at the beast and the worst a gummy, wet center. Bear in mind that it takes time to cook through the center. This happens long after the top is golden. Therefore, you need to tent the top with foil in the middle of baking. That helps to prevent the burning of the top. Why does any bread fall? Usually, it’s because it needed to bake for a longer time. Even if your bread falls, you should know that it’s not the end of the world because it will still taste great. Sometimes, the keto bread can fall even if you do everything by the book. How to know your bread is cooked through? There is a way to test this, and it is not the toothpick test. Maybe this will be surprised by some, but you should use the toothpick test. There is another way for you to check the doneness of the keto bread. The top of the bread should be firm. Also, it shouldn’t make a squishy sound once you press it down on the center of the bread. Last, but not least the internal temperature should be around 200 degrees F.
Understand that this keto bread isn’t a crusty loaf. This is an airy, soft, and fluffy bread. This is an amazing bread for sandwiches. However, if you prefer a paleo bread that has a crust, you can try the other recipe for low carb almond flour bread instead. We hope that the tips above mentioned will help you get the perfect paleo bread. Do you know how you can use the paleo bread? It might surprise you, but you can use it the same way as white bread. The best thing about this paleo bread is that it is that versatile. Below you will see a couple of ideas. With this bread, you can make sandwiches. You can use homemade avocado mayo, turkey and lettuce. You can even toast this bread and serve it with but butter, chimichurri sauce or butter. You can dip it in egg beaten and use sweetener and cinnamon. You can be brave and experiment on your own. Try different things and see what it works best for you. Keto Bread & How to Store It? When it comes to the storage of this bread, you should know that it is very similar to the usual bread in some ways. However, its storing is different in others. Just like any other bread, even this bread will go stale if you leave it to sit out in the open for a long time. Maybe it won’t happen as fast, because of the egg whites and fat content, but it will still happen. You should also bear in mind that this bread goes bad faster in comparison to regular bread at room temperature. You should feel free refrigerating this bread. If you refrigerate it will last around 7 days, and maybe a couple of days after that. If you decide to store your bread this way, make sure to slice it as you need it and not all at once. Another way to storage this bread it is best to wrap it in a parchment paper. Or you can put the bread in a parchment paper bag. It is not recommended to store it in things that trap moisture such as plastic bags. You should know that paleo bread is prone to absorbing moisture. If somehow it gets wet, you can save it by toasting it. Most people wonder if they can freeze keto bread. Let’s solve this dilemma once and for all; you can freeze keto bread. You freeze this bread for months. However, you should slice it first, so that you can take just as many slices as you want out of the freezer. Food processor– for this bread you can use this one and for other things as well. This is fast and easy fluffy white paleo bread with only five basic ingredients. These are optional ingredients, but they are also recommended. You should preheat the oven to 163 degrees C or 325 degrees F. Then you should line an 8 ½ x 4 ½ (22×11 cm) loaf pan with some parchment paper. Make sure to cover the whole pan even on the sides. In a big food processor combine the baking powder, almond flour, erythritol, sea salt, coconut flour, xanthan gum. Make sure to pulse until combined. Then you should add the melted butter, pulse until its crumbly. If necessary, scrape down the sides. Take a big bowl and a hand mixer. Use them to beat the whites and cream of tartar (optional). Do this until the formation of stiff peaks. Bear in mind that the whites will expand a lot, so you need to have a big bowl. To the food processor add ½ of the stiff whites. Pulse until combined making sure not to over-mix. Pour the mixture into the bowl with the egg whites and fold until no streaks remain. Don’t stir, just gently fold in order to keep the mixture fluffy. 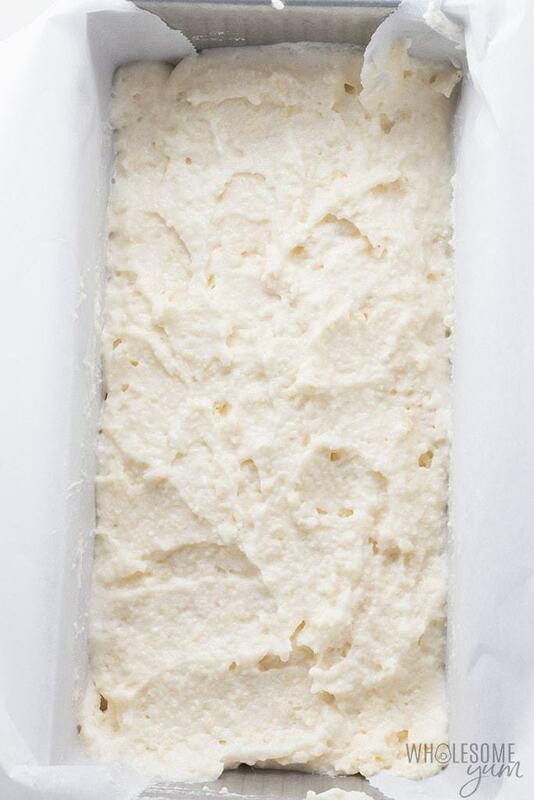 Put the batter to the loaf pan and just smooth the top. Then push the batter toward the center in order to round the top. You should bake for around 40 mins until the top of your bread is golden brown. After you need to tent the top using aluminum foil, and then you should put the pan back in the oven and bake for another 30 to 45 mins. You should bake until the top is firm. And until the bread doesn’t make a squishy sound once it’s pressed on the top. The internal temperature needs to be 200 degrees. Before removing the bread from the pan, you should let it cool completely. Below there is a video showing how to make this bread. This is the easiest way to make the best keto bread.